Vanuatu broadcasters and media came together with the National Disaster Management Office, and the Vanuatu Meteorology and Geo-Hazard Department to plan and prepare their Climate and Disaster Resilience Plans this week. Funded by the Australian Department of Foreign Affairs and Trade through ABC International and PACMAS, the Pacific Media Assistance Scheme, and implemented in partnership with the Secretariat of the Pacific Communty (SPC) and the Secretariat of the Pacific Regional Environment Programme (SPREP), this training seeks to assist Pacific broadcasters in eight countries in preparing plans that will help them be more resilient to the effects of climate change and disasters. Having the very recent experience of category five Tropical Cyclone Pam, the broadcasters and government ministries were able to share their experiences and lessons learnt to help develop plans. This will help them continue broadcasting warnings and information to the public during times of disaster when people need this service the most. According to the Acting Director of the Vanuatu Meteorology and Geo-Hazard Department of Vanuatu, David Gibson, the workshop is useful in helping the media understand the terms and definitions used by the Meteorological Services, and the National Disaster Management Office. This includes the differences between the various levels of advisories and warnings issued during disasters. “The National Disaster Management Office and the Meteorological Services rely on the media to get this information out to the communities accurately and in a timely fashion in order to save lives,” Mr Gibson said. “The hope is that in the development of the Broadcasters Climate and Disaster Resilience Plans their needs are met as well as ours, and that our relationships are strengthened through formal memorandums of understanding between us and the media,” He said. With the memory of Cyclone Pam fresh in their minds, lead trainer Dr Kirstie Méheux from SPC was able to help the broadcasters identify gaps in their current way of responding to disaster and how they could be better prepared for future events. “It is important that after a disaster we take time to reflect on our experience to identify the things that worked well and also the ways we can do things better next time. This training is a timely opportunity to capture lessons and develop strategies to learn from them,” Dr Méheux said. 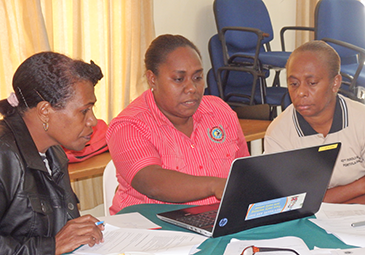 Vanuatu Broadcasting and Television Corporation (VBTC), along with private broadcasters Capitol FM 107 and Buzz FM 96, all developed Climate and Disaster Resilience Plans during the training, followed by a simulation exercise to test the plans, identify gaps, and refine the plan. Newsroom training on understanding climate and disaster management terms for journalists was held on the last two days of the week. A “lessons learnt” discussion between all media, and stakeholders, including VMGD, NDMO, the Vanuatu Police Force, and local telecom services facilitated by SPREP’s Salesa Nihmei finished off the week. The purpose of the meeting was to capture all the experiences from the media and the stakeholders during Cyclone Pam as a case study in order to map a way forward. This will assist with the National Lessons Learnt Workshop to be held at the end of the month. The Broadcasters Climate and Disaster Resilience Plan project is being rolled out across eight Pacific island countries including the Cook Islands, Kiribati, Palau, Samoa, Solomon Islands, Tonga and Tuvalu, with Vanuatu being the sixth country to complete their training. The training is being implemented by SPREP and SPC and exercises in the participating countries are due to be completed by the end of August 2015.